I'm going to be busy all day with my weekly Dwimmermount sessions, but I thought I'd leave you with a nice photograph to tide you over till tomorrow. 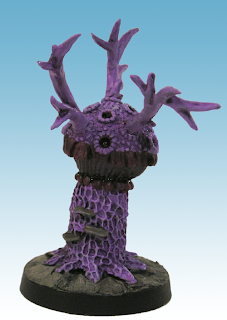 It's a pic of an Otherworld Miniatures violet fungus from my collection, paint job courtesy of Dordagdonar's player. This morning, I was inspired and finally put the finishing touches on the character class write-ups for Dwimmermount. Here's the chart for magic-users, to give you an idea of how I'm presenting them. As I always intended, I've included level titles, both because I think they're something that's sadly absent from all the retro-clones to date (though I understand why) and because I think their presence can, if done properly, add a lot of flavor to a campaign setting without the need for adding any mechanics. In this case, the titles are Thulian in origin (or, rather, Termaxian-influenced Thulian) and correspond to degrees within the state-sponsored schools of magic. So influential were these schools that, even after the fall of the Thulians and their Termaxian masters, the degrees remain common terms by which to refer to magic-users of varying power. This one is courtesy of Thomas Fitzgerald. As you can see, it's actually a full logo rather than just a title. Once the cult of Turms Termax became the de facto power behind -- and, eventually, on -- the Thulian throne, its hierophants took on roles of importance throughout the empire, acting as advisers to provincial governors, military leaders, and even the clerics of the state-sanctioned Great Church. Each of these hierophants brought with him a peculiar magical device known to later generations as a brazen head. 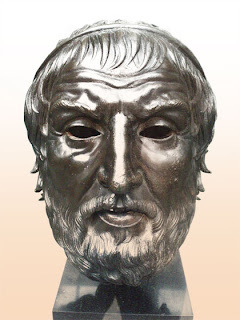 As its name suggests, a brazen head is a brass representation of a man's head (that of Turms himself, according to some sources). However, the head is enchanted and possesses two unique functions. Firstly, once every three days, its user may commune with Turms Termax (as per the 5th-level cleric spell of the same name), with the god's answers issuing from the mouth of the head. Secondly, its user can, if the proper command words are known, communicate by speech with the user of any other brazen head within 5 miles of his current location. Brazen heads were never produced in large numbers, but, over the centuries, enough were crafted that they can still be found in Thulian ruins everywhere. Likewise, many magic-users (not to mention groups like the Argent Twilight) seek out brazen heads, using them as a means to gain access to the secret wisdom of Turms. Others seek out the heads to destroy them, believing them to be a tool by which the god of magic -- or his contemporary cult -- seeks to spread his influence throughout the world. Indeed, there are many who claim that brazen heads only selectively tell the truth, so as to seduce their users into the unwitting service of the Thrice-Great. There are similar claims that continued use of a brazen head leads to religious mania, with the user forsaking all other deities in favor of Turms. True or not, there are many superstitions about brazen heads and the mere mention of them is enough to frighten some who fear and revile Termax and his once-mighty cult. Reader Richard Guy whipped up a couple of alternatives, based on comments made in the other posts. What do people think of these? 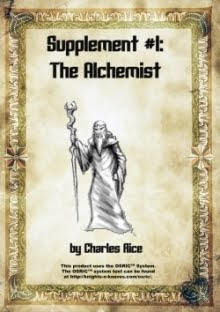 Supplement #1: The Alchemist is a short (5-page, one of which is the cover and another the Open Game License) PDF product by Charles Rice. It introduces a new character class for use with OSRIC, although it could quite profitably be used with almost any old school/retro-clone version of D&D. The PDF is clearly written and cleanly laid out. The cover artwork by Joe Calkins is nice enough, better I think than that included in previous Vigilance Press releases, but it doesn't really suggest an alchemist to me. The alchemist class is not described as either a player of non-player character class, leaving that up to the referee to decide for his own campaign. That's for the best in my opinion. In the old days, the term "NPC class" was code for a new (probably overpowered) PC class. There was an unspoken assumption that only TSR could create new PC classes and so there was this kabuki dance in the pages of Dragon when it came to clever new sub-classes, which everyone involved knew would be used for PCs, even if no one would admit this outright. The alchemist is one such clever new class, one that both represents a genuine literary archetype and employs a different mechanical model than any of the existing classes. Unlike, say, the magic-user, the alchemist has no inherent magical abilities, relying instead on various formulae he can make (often at significant cost), such as acids, poisons, and medicines, in addition to the ability to create potions. The effectiveness and extent of these formulae increases with level: low-level alchemists are both limited in their abilities and prone to unpredictability and error, while high-level members of the class are much more powerful. At 20th level, alchemists has mastered the ability of transmutation and, depending on the referee, may attempt a potentially wide variety of changes between materials and states. I'll quibble that this ability is earned at too high a level for an AD&D-style character class, even as I appreciate its openness to individual interpretation by the referee. Regardless, the rules for alchemy are simple without being simplistic and offer a lot of options without being overwhelming. Interestingly, the alchemist uses the thief combat and saving throw tables, in addition to the thief's Hit Dice and armor selection (weapons are more limited). This called to mind Gary Gygax's proposed mountebank class, albeit without the implications of deceit and quackery. Still, it wouldn't be hard to play an alchemist in that vein, which may explain why I was so taken with it. It's definitely a "non-magical magical class," if you get my meaning, and, as such it might not suit every type of campaign. In a more low-magic, pulp-inspired setting, I can imagine an alchemist being a very useful addition to an adventuring party. Even in a more "traditional" group, the class would have its uses, with acids providing an alternative to lockpicking and medicines to clerical healing, for example, although neither replaces the more potent abilities of those other classes. I like the alchemist and would certainly allow a player to take it up if he wished to do so, but then alchemy and alchemical-inspired "magic" plays an important role in my Dwimmermount campaign. In the end, I suspect one's reaction to this product will depend greatly on what one thinks about alchemy and how it ought to be presented in a fantasy setting. The Alchemist definitely takes a generally more "mundane" approach, with alchemy being similar to a more fantastical form of chemistry -- a "science," even if it's sometimes less than exact. Again, that may not be to everyone's taste, thus limiting the utility of this product if you don't share a similar perspective. If you do, it's well worth its $1.00 price tag. Get This If: You'd like expanded -- but not complex -- treatment of alchemy and want a class designed to take advantage of it. Don't Get This If: You're happy with the existing approach to alchemy and don't see the need for an alchemist class. What do you think of this font? Does it suggest anything to you? Is it evocative of pulp fantasy decadence or does it look too "historical?" I noticed that, in the comments about my last session of the Dwimmermount campaign, there was some incredulity that I played every weekend with my group. Now, given the fact that the campaign is now a little over a year old and there have only been 28 sessions, you can see that, in point of fact, we get together more like once every other week. The realities of "adult" life -- work and family responsibilities, for example -- mean that we often have to skip a week. But, that said, we aim to play every week and we quite often will hit that mark consistently for long stretches of time, with the summer and period around Christmas/New Year being the most prone to interruptions in our play schedule. I am, however, getting the distinct impression that gaming even every other week is something of an anomaly among my readership. Am I mistaken in this? How often do you typically meet to roleplay? I ask both out of personal curiosity and because a regular jab made at the old school movement is that it's made up primarily of guys who no longer actually game but just like to talk about gaming. Is there any truth to this? A frequent complaint about old school Dungeons & Dragons is the need for a matrix to tell you what your character needs to hit an opponent in combat. This fact is also often used as a justification for the shift to an ascending armor class system, like that introduced in D&D III, which obviates the necessity of such a chart. While it's true that old school D&D has traditionally employed a chart to present "to hit" numbers, that's not the only way the information could be presented. In my own Dwimmermount campaign, I don't use a combat chart at all when refereeing. Instead, when a monster attacks, I roll a D20, and add the monster's Hit Dice and the target's (descending) armor class to the result of the dice roll. If the sum is 20 or more, the attack is successful. This system is simple and quick and I don't need to consult any charts. Example: A 4th-level fighting man wearing plate mail (AC 3) is facing off against an orc champion wearing chain mail and carrying a shield (AC 4). His player rolls 1D20 and scores a "2." To this the player adds his character's combat bonus (+2) and the orc's armor class (4), resulting in a total of 8. Since that doesn't equal 20 or more, the fighting man misses. The orc (who has 2 Hit Dice) attempts to attack in return. The referee rolls "15." To this he adds the orc's Hit Dice and the fighting man's armor class (3). The result is exactly 20, meaning that the orc's attack succeeds. Like the LBBs themselves, picking up a volume of The Arduin Grimoire and randomly reading a page is almost guaranteed to result in an interesting discovery. Sometimes it's genuinely insightful, while at other times it's amusing. Other times I just scratch my head and wonder, "What the heck was Hargrave thinking?" A good example of the latter comes from the original Grimoire, in a section devoted to "notes on combat:"
Another point that has come up, that needs clarification: YES! an invisible person in a thick fog or mist or rain or even smoke cloud will be visible by his outline. No exceptions to this rule should ever be allowed, because it is simply physics. Remember that the Grimoire was published in 1977 and likely reflects rulings made by Hargrave and his circle before that date. Had it been published in, say, 1983 or thereabouts, I'd have considered the "it is simply physics" perspective to be very much in line with the kinds of articles you regularly saw in Dragon at the time. But, as you can see, it's of a much earlier origin -- a reminder that nearly all the schools/styles of gaming were present, to varying degrees, from the start of the hobby, even if many of them were outliers without much influence until later on. I'll have more to say about Arduin in the coming weeks. As I've been re-reading it, I'm noticing that, moreso than almost any other published product from its era, it's primarily the record of a particular localized gaming "culture" and arrogates to itself no claim of authority beyond that. In short, it's a product by gamers for gamers "offered in the spirit of sharing," Hargrave puts it in his "forward" [sic] rather than a definitive statement by a game designer or game company. Much as I would never use at least half of what's in these books, I can't help but appreciate Hargrave's attitude. DEITIES & DEMIGODS is an indispensable part of the whole of AD&D. Do not fall into the error of regarding it as a supplement. It is integral to Dungeon Mastering a true AD&D campaign. Experienced players will immediately concur with this evaluation, for they already know how important alignment is, how necessary the deity is to the cleric, and how interaction of the various alignments depends upon the entities which lead them. Those readers not well-grounded in ongoing campaigns must take my word for all this, although they will soon discover for themselves how crucial the deities of the campaign milieu are. Looking back on it now, I can see so many problematic statements in the few lines of the foreword quoted above, but, back then, Gygax's words were law and if he said the DDG was "integral to Dungeon Mastering a true AD&D campaign," then it was so. Now, though, I see things somewhat differently. A "true AD&D campaign?" What do those words even mean? That it's impossible to play the game without the information contained in Deities & Demigods? Or is it that Gygax believes the notion of gods to be a foundational principle of the game? Either position is, in retrospect, somewhat questionable. Not only is it possible to play even AD&D without recourse to the DDG, it's possible to play the game without gods at all. Moreover, the particular approach to the divine adopted in Deities & Demigods is by no means the only one. I've noted before that early gaming often evinced a rather different approach, but, even if one adopts a polytheistic model, there are other ways to portray the gods than as, for all intents and purposes, extraordinarily powerful "monsters." Deities & Demigods is, in many respects, just another Monster Manual, filled with pages and pages of statistics, such as armor class, hit points, and attack forms. 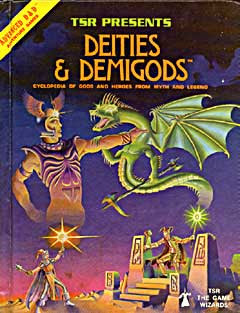 Despite the claims of the foreword, the book did little to impress upon me the importance of gods or their worship in AD&D, as the book provides only the most cursory information on the role of religion in the game, instead focusing on extending ability score modifier tables and elucidating the powers of gods of various ranks. If I were to point out a single, fundamental flaw in the way Dungeons & Dragons has developed over the years, I'd say that it was its relentless drive to quantify everything. It's a flaw Deities & Demigods demonstrates time and again. A book detailing various historical and literary pantheons, along with information on including them in a campaign, is a great idea. But why include game stats for the gods at all? Why tell us that Ra has 400 hit points or that Mjolnir deals 10d10 damage? How does this information accord with Gygax's claims that the DDG lays out "how crucial the deities of the campaign milieu are?" In my experience, such details only fueled foolish arguments over which god was most powerful, not to mention dreams of marching on Mount Olympus to slay Zeus. What is so "integral" to the game about this? Truth be told, I don't hate Deities & Demigods. I simply don't see it as anything more than a minor volume in the AD&D library, less significant even than Unearthed Arcana, which, for all its manifest faults, contained more unambiguously useful information to the game. I also think it contributed to the power creep to which D&D has always been prone, as well as being part of a reductionist "demystifying" approach to magic and the divine. As a younger person, I enjoyed reading the book, since it included gods and mythologies with which I wasn't familiar. I didn't get much direct use out of it, however, since I'd created my own religions and didn't see any need to provide stats for divine beings. That's an opinion I still share, even though it runs counter to the trajectory the game followed and that seems to have appealed to many of its players. There are some reviews I look forward to writing; this is not one of them. 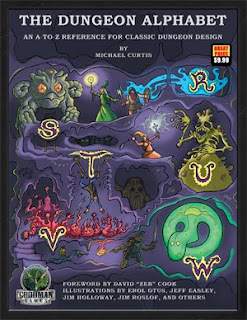 I say that not because The Dungeon Alphabet by Michael Curtis, author of the excellent Stonehell Dungeon, is a bad product -- quite the contrary! It is in fact a well-written, beautifully illustrated, and inspirational volume. Indeed, it may be the single best statement of the Old Ways yet put into print, a feat that's all the more remarkable because it's not presented as a philosophical manifesto but rather as an abecedarian syllabus, employing the principle of "show, don't tell" to sidestep the usual litany of complaints about how "old school" can't be defined and any attempt to do so is both wrongheaded and doomed to failure. If anyone, after absorbing The Dungeon Alphabet's 48 compendious pages, still claims not to understand what is meant by "old school," the fault will lie not with Curtis but the reader. It's precisely because there's so much right about The Dungeon Alphabet that I didn't look forward to writing this review. Any compliments I pay to it will seem banal and any criticisms I make of it will seem petty. The book presents us with 26 entries -- one for each letter of the alphabet -- each of which is ostensibly connected to some topic pertaining to dungeons, such as altars, doors, oozes, or traps. Each entry is a brief, two or three paragraph, meditation on the topic in question, providing both practical advice on using the subject matter in designing a dungeon and "philosophical" musings on the whys and wherefores of doing so. It's a potent combination and Curtis's writing is straightforward without being vapid and detailed without being pedantic. Each entry is rounded out with a random table of some kind to jumpstart one's imagination about the topic (such unusual jewel properties or thirty results of a pulled lever). The Dungeon Alphabet is lavishly illustrated, boasting a full color cover by Erol Otus. The interior art contains a mix of artists associated with earlier editions of D&D -- Jeff Easley, Jim Holloway, Jim Roslof, the aforementioned Otus -- and a number of newcomers, including old school renaissance favorite Peter Mullen. In my opinion, there's not a single bad piece of art in the book and that includes the illustrations done by Easley and Roslof, two artists I never much liked back in the day. Roslof in particular impressed me with the quality of his work, something I'd never have expected. The book also includes a foreword by David Cook in which he extols the virtues of whimsy and randomness in both game design and game playing -- a fitting entré for this volume. The Dungeon Alphabet is a thin hardcover retailing for $9.99, which is an excellent price, but allow me to nitpick nonetheless. Given its subject matter and method of presentation, I wish it had been published as a smaller book, perhaps adopting the format of a children's book. That would have, I think, better suited it and made it a more interesting artifact to boot. I suspect that the ironclad demands of retail shelf space dictated the book's format, which is a shame. I also think that the random tables are somewhat uneven in quality. The original blog posts on which the book is based had no random tables (that I can recall -- someone can correct me if I am mistaken); they're new to this version of the text. While some are really excellent (the random book titles, for example) and would prove quite useful in play, others (such as thirty fiendish traps) are fairly uninspired. Again, I suspect the demands of retail sale dictated that the book be expanded to a greater length. I certainly don't regret the inclusion of the random tables, as many are as inspiring as the text, but they're not as consistently excellent as the rest of the book. In the end, it's Michael Curtis's terrific little entries that are the heart and soul of this product and they never once disappoint. Each one of them is a tiny masterpiece, a succinct elucidation of not just what makes a good old school dungeon but also what distinguishes the Old Ways from the new. Long ago, I printed out the blog posts on which The Dungeon Alphabet is based and, whenever I lacked for inspiration in detailing Dwimmermount, I re-read the posts and carried on. Now that I have the whole thing in "proper" book form, along with random tables, you can be sure that it'll always be close at hand, ready to give me more great ideas to inflict on my players. Get This If: You're looking for a nice summation of old school dungeon principles to inspire you. Don't Get This If: You have no interest in the Old Ways or in attempting to understand them. Randall over at RetroRoleplaying has set up a donation fund to help defer the costs of his wife's cancer treatments. Anyone who donates even $1 will get access to a number of old school-related goodies, such as the 1970s fanzine The Grimoire. However, whoever donates the most between now and February 5 will receive what Randall's calling the "OD&D Woodgrain/Brown Box special:" the three LBB (Men & Magic, Monsters & Treasure, and The Underworld & Wilderness Adventures -- Third printing purchased with their Brown Box box, Supplement I: Greyhawk (2rd printing), Supplement III: Blackmoor (1st printing) and Supplement III: Eldritch Wizardy (7th printing), and Supplement IV: Gods, Demi-Gods, and Heroes (5th printing). Also included are the table sheets from the brown box set, a copy of Arduin Grimoire Volume I, an almost pristine copy of Booty and the Beasts with its Erol Otus artwork, a copy of Chainmail, and a few cut Dungeon geomorphs. I've reproduced a photograph of these items from Randall's blog below. Even if you can't donate enough money to have a serious shot at these awesome OD&D relics, it's a very worthy cause nonetheless. Randall's a great, often insightful, old school blogger. If it's at all possible to help him out, please do so. Dwimmermount resumed after a two-week hiatus because of family and work-related interruptions on the part of myself and one of the players. While unavoidable, these interruptions are the bane of a RPG campaign in my experience. When playing only once a week, making sure that you do play once a week is essential to establishing and maintaining the "rhythm" on which good campaigns thrive. Any disruption of that rhythm ensures that, at the very least, it'll take a session or two before it's re-established and, at the very worst, could derail things sufficiently that the campaign suffers a mortal wound. I've seen the latter happen enough times to fear the possibility, so I dislike it whenever we have to miss one of our weekly Dwimmermount sessions. Fortunately, my players are sufficiently tenacious to overcome the inertia of missing sessions, but there's no denying that the first session after any interruption is an unsatisfying one, at least for me as the referee. This past weekend's session was a good example of that. Although the characters continued to press on into the catacombs associated with the temple of the Iron God, not much of significance happened. I don't just mean that in the usual sense of the session's lacking any revelatory moments -- though it didn't. Rather, nothing really clicked. There were some combats, much exploration, a few bits of treasure found, and even some addition clues about the nature of the Iron God, but none of it gelled for me. I felt like I was going through the motions rather than actually playing the game. That's what I mean about losing one's rhythm. I don't expect every session to be a coherent, dramatically-satisfying roller coaster ride of non-stop fun. Such an expectation is, I think, at the root of why the Old Ways aren't well supported in contemporary games. It's certainly not something I need for an individual session to be enjoyable, particularly in a player-driven megadungeon campaign, which, by its nature, will be uneven in its feel from week to week. Since I derive my fun not so much from seeing my plans well executed -- I have no plans -- I don't mind when a session consists mostly of the characters wandering around in the dark, stumbling across this or that, as they delve deeper into the dungeon. For me, that's the whole point of the game. But what happened this last weekend was what always happens when my friends and I don't get together regularly: we chatted with one another about the usual topics before the game and we continued to do so during the game. There were many digressions, asides, and breaks in play as we simply socialized. Now, there's absolutely nothing wrong with this. I play RPGs in order to socialize with my friends, after all, and I enjoy their company even when we're not gaming. However, satisfying gaming, in my experience, demands a certain degree of focus that's hard to summon up when I haven't seen my friends in a few weeks. I'd much rather just talk with them, even about trivialities, than sit around the dining room table and roleplay. Interruptions thus guarantee that the first session after the interruption ends will likely see not a lot of gaming. That's what happened this weekend. I'm not terribly upset about it, but, by the same token, I do like to have as many satisfying game sessions as I can and this last one simply wasn't satisfying for me (or, I think, my players). With luck, next weekend will see us get our groove back. I've been having a lot of weird dreams lately. Last night I had one in which author L. Sprague de Camp -- looking more or less like this -- showed up on my doorstep and invited himself to dinner at my house. Despite the abruptness of his arrival, he proved a very charming guest, regaling me with lots of fascinating anecdotes about other science fiction and fantasy authors. Throughout it, though, he was clearly trying to steer me toward talking about my opinion of Robert E. Howard and the Conan pastiches he and Lin Carter wrote. Not wanting to upset him -- why I'm not sure; perhaps I just wanted to be a polite host -- I deftly avoided his verbal snares and kept the conversation on other topics, including De Camp's own writings, which seemed to please him. Like I said: weird dreams. I'm pretty sure C.S. 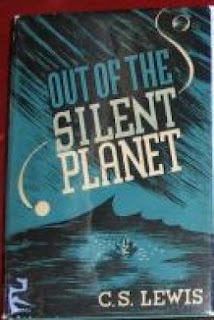 Lewis would have objected to calling his 1938 novel, Out of the Silent Planet, a "pulp fantasy" and perhaps rightly so. Indeed, his "Space Trilogy," of which this is the first volume, might in some ways be seen as a rejection of many staples of the sword-and-planet genre of which it might superficially seems to have much in common. It is, after, the story of an Earth man -- Dr. Elwin Ransom -- who journeys to another world and finds his unique talents essential to preventing a great evil from transpiring. Of course, Dr. Ransom's unique talents are not superior strength, hardiness, or military training but rather his facility with languages. Ransom, whom Lewis may have based, at least in part, on his friend J.R.R. Tolkien, is a philologist who uses his linguistic knowledge to learn the tongue of the inhabitants of the planet Malacandra, as Mars is called by them. This enables him to learn from them the history of not only Mars but also of Earth, the "Silent Planet" mentioned in the book's title, so called because, until the events of the book, what transpires on it is a mystery to the other beings of our solar system. Unlike, say, John Carter or Esau Cairn, Ransom's journey to Mars was as the victim of a kidnapping. An unscrupulous physicist by the name of Professor Edward Weston plans to travel to Mars both to mine gold (which the planet has in abundance) and to lay the groundwork for the eventual colonization of the planet by human beings. Of course, doing so will result in the subjugation and perhaps extermination of the native Malacandrans, a fate Ransom cannot countenance and against which he struggles in the course of the novel. Fortunately for him, the philologist has allies in unexpected places and they too reveal much about the true nature of the cosmos. Out of the Silent Planet is what might be called "theological science fiction," for its main purpose is not describe an adventure story set on another world as to explore the theological implications of life on other worlds from a Christian perspective. Even if one does not share Lewis's religious convictions, it's nevertheless a fascinating book purely as a bit of speculation about humanity's relationship to and responsibilities toward other intelligent life forms. Likewise, the cosmology Lewis outlines, which draws heavily on medieval notions of the universe, is very well done and, as others have noted already, was an inspiration to me as I worked on my planes-as-planets notion. I suspect others will be similarly inspired. I have a great fondness for the Space Trilogy, which I first read in high school. I was never a fan of the Narnia books, which I found unsubtle and frankly boring. The Space Trilogy, though, was much more to my liking and, while not without its flaws, both as bits of speculation and as novels, their virtues far outweigh them. The middle book in the trilogy, Perelandra, set on Venus, is in my opinion the least interesting of the three and the one where Lewis's weaknesses as a writer become most apparent, but Out of the Silent Planet and That Hideous Strength, the final book in the series, are among my favorite novels. They're both well worth reading if you've never done so. I'm contemplating the acquisition of volumes IV-VIII of the Arduin Grimoire series and would like some advice from those who own them: are they worth getting? I have the original three volumes and, while I'd never use everything in them, I've found them quite inspiring and often cherrypick good ideas/mechanics from them. Do the later volumes provide the same "bang for the buck?" If the general consensus is that they do, I'll likely pick them up, since I've been curious about them for some time. Does This Mean I'm Famous? So I go and check my blog stats this morning and I come across some hits from a page I'd never seen before. I take great interest in these hits, because most of my hits come from the usual suspects of the old school blogosphere. Hits from a new site means that someone from outside our little echo chamber has taken interest in -- or umbrage at -- what I'm writing here. Imagine my surprise, then, when I discovered Grognardia had been mentioned in an article in the entertainment section of the Los Angeles Times -- and very positively, no less. I know I shouldn't be as pleased with this as I am. In general, I'm a pretty self-deprecating guy and don't take compliments well (not that I take criticisms much better). Still, I can't deny this put a big smile on my face. It's gratifying to know that one's writing is met with approval by someone with whom I have no connection. It's a small vindication of what I'm trying to do here and an encouragement to keep doing what I'm doing. It's just the shot in the arm I needed. Thanks, everyone. Having spent more time thinking about "outer space" in my Dwimmermount campaign, I've made a few tentative decisions on how I'm going to handle things. Chief among my decisions is to re-imagine most of "the planes" in D&D as planets elsewhere in the universe rather than as universes in their own right. In early D&D, planes are nebulous things and the term seems to be shorthand for "another world," without any codified notion of what does and does not constitute a plane. Generally, if it's somewhere other than the world in which the campaign is set, it's a plane. There are a few canonical exceptions to this -- such as Mars -- but, by and large, the term "plane" is used very loosely to describe somewhere else. Much as I love AD&D's "Great Wheel" cosmology, its conception of the planes isn't one I want to import into Dwimmermount. I really like the esthetics of "other worlds" being, literally, other worlds. I've already established that, in the past, there was much greater communication and travel between the campaign world and Areon and Kythirea and portals to those places still exist -- and operate -- in ancient ruins and the like. Similarly, certain high level spells allow easy transit between worlds, but such magic is rare and little understood nowadays. In this set-up, summoning "extraplanar" beings like elementals is in fact summoning beings from another planet. Again, I like the esthetics of this, because it helps me to shake off the residue of other planar cosmologies by re-imagining extraplanar entities as "aliens" in the pulp sense of the term. I think the planes-as-planets approach is useful because it doesn't (to me anyway) make the planes feel so abstract. One of the problems I've always had with AD&D's planes is that they were too closely tied to alignments and the gods. Now, there's nothing wrong with that and I think much can be done with that notion. But if what one has in mind is something more in line with The Dying Earth, for example, it's much easier to conceive of all these other worlds as, literally, other worlds. That makes it simpler for me to imagine them and (I hope) simpler for the players to do the same. As a younger person, I was always more intrigued by what AD&D called "Alternate Prime Material Planes" and, as a fan of the Harold Shea stories, I want to include more of that kind of thing in my campaign. Ideas are still percolating but some of them are definitely starting to solidify. Mickey Rourke has apparently been cast as Conan's father. I don't have much to say about Rourke, but I will add that the presence of Conan's father in the film doesn't make me happy, because it implies that, once again, Hollywood is demands an "origin story" for a character who, frankly, doesn't require one. I think we know more about Conan's grandfather than we do about Conan's father, who, so far as I know, is never mentioned in the Howardian corpus (someone can correct me if I am mistaken). That means Rourke is portraying a wholly (largely?) invented character, one I just don't see the need for, but then what do I know about making schlock movies? We’re making tin gods out of those poor buffoons in Hollywood; I dote on movies and appreciate the scanty art therein but I consider the profession about the most debased and debasing I know. The Cimmerian's Deuce Richardson has reported that Jason Momoa has been cast as Conan in the upcoming feature film. While I can't say I'm particularly pleased by this story, if true, I honestly don't think that the casting of Momoa, about whom I know little beyond what I can see, is going to make or break this picture. Far more worrisome is the story treatment, which seems to have even less of Howard about it than the original Schwarzenegger flick. Momoa gets points for at least not being an underwear model turned "actor," but, on first blush, he doesn't quite look the part. Maybe with a different haircut, some blue contact lenses, and an appropriate costume, I could buy him as Conan. I don't know; it's hard to imagine, but I could grin and bear it if the script were good. I have little hope of that, unfortunately, and so I'm left with the hope that the movie will come and go without much notice and leave the work of introducing a new generation to Conan to the writings of Howard himself. Janus must be very fond of writers, for so many were born this month: J.R.R. 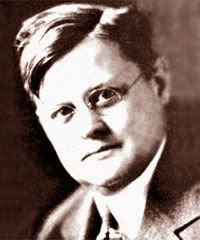 Tolkien, Clark Ashton Smith, Edgar Allan Poe, Abraham Merritt and, today, Robert Ervin Howard. Of them all, Howard is possibly unique in having created a character -- Conan -- who is a genuine pop cultural icon, his name recognized even by people with no prior connection to pulp fantasy. The irony is that that recognition often acts as an impediment to appreciating Howard's genius in having created him. Indeed, the popular conception of Conan bears only a passing resemblance to the character who first strode onto the pages of Weird Tales in December 1932. It may sound fantastic to link the term "realism" with Conan; but as a matter of fact - his supernatural adventures aside - he is the most realistic character I ever evolved. He is simply a combination of a number of men I have known, and I think that's why he seemed to step full-grown into my consciousness when I wrote the first yarn of the series. Some mechanism in my sub-consciousness took the dominant characteristics of various prize-fighters, gunmen, bootleggers, oil field bullies, gamblers, and honest workmen I had come in contact with, and combining them all, produced the amalgamation I call Conan the Cimmerian. It's a pity that this character, this amalgamation of so many real people Howard met in Depression era Texas, isn't the one with which so many are familiar today. He is, for my money, vastly more interesting than the dim, loincloth-wearing, stuffed mattress to be found in so many popular portrayals of the Cimmerian. Of course, Howard himself has fared little better in the popular imagination than has his most famous creation. To the extent that anyone even knows any facts about the author's life, they're likely based on distortions, misrepresentations, and outright lies, such as those L. Sprague de Camp peddled in Dark Valley Destiny. Fortunately, the last three decades have seen the rise of a critical re-evaluation of both REH and his literary output, finally allowing both to be judged on their own merits rather than through the lenses of men with axes to grind. This is as it should be. Robert E. Howard was a man like any other. He had his vices as well as his virtues; there is no need more need to reduce discussions of him to mere hagiography than there is to ill-informed criticisms. But men, particularly artists, need to be understood in their proper context, historical as well as cultural. Until comparatively recently, Howard hasn't been given that chance. Like Conan, he's been reduced to a caricature, a laughable shadow of his full depth and complexity that illuminates little about either his life or his legacy. One cannot write about Robert E. Howard without writing about Texas. This is inevitable, and particularly so when discussing any aspect of Howard's biography. To ignore the presence of the Lone Star State in Robert E. Howard's life and writing invites , at the very least, a few wrongheaded conclusions, and at worst, abject character assassination. This doesn't keep people from plunging right in and getting it wrong every time. It's often claimed that Howard led a tragic life but I'm not so sure that's true. If anything, he's had a far more tragic afterlife, for, despite of all the Herculean efforts made to elucidate his life and art, he is still so often remembered as "that writer who killed himself because he was upset about his mother's death." Couple that with the disservice done to his creations and it's a recipe for the frustration of anyone who reveres his memory, warts and all. Yet, there is reason to hope the tide may eventually turn. Del Rey has done terrific work in bringing Howard's writings -- and not just his tales of Conan -- back into print. Better still, these are all Howard's writings, not the hackwork pastichery of others. In fact, it's becoming increasingly difficult to find those faux Conan stories on bookstore shelves. It's my hope that, at the very least, this will ensure that future readers will have a better chance to encounter the genuine articles than I did when I first sought out stories of the Cimmerian as a young man. Likewise, the facts of Howard's own life are also becoming more well known, at least among scholars and dedicated enthusiasts of fantasy. It may be some time before past falsehoods are cast aside for good but it's at least possible to imagine that now, whereas it was not even a few years ago. Like the 104th birthday of Robert E. Howard, that's something worth celebrating. Much as I loved Star Wars as a child, my heart belonged first to Star Trek. I remember watching reruns of the Original Series on Saturday afternoons at my grandparents' home in Baltimore. My aunt, who was unmarried at the time, had been a fan of the series and it was she who introduced me to it in syndication. (She also took me to see Star Wars on the movie's opening weekend, so she has a lot to answer for). Star Trek had a profound effect on me as a kid and it molded my imagination in ways impossible to reckon. Indeed, the series became the standard by which I judge most other televisual and cinematic science fiction. The RPG came in a large, deep box and consisted of three books: a rulebook, an adventure book, and deckplans for Constitution-class starships and the Klingon D-7 battlecruiser. The box also included cardboard counters of starships and individuals, as well as two Gamescience D20s, numbered 0-9 twice. I still own those D20s and they roll just as well now as they did then. The rulebook was 128 page in length -- rather lengthy compared to, say, Traveller -- but it was quite comprehensive, covering everything from character generation to alien races to technology to starship combat. The game used a simple percentile system for skills and other actions. Combat was, in my view, unnecessarily complex, using an action point system to determine how many and what type of actions a character could perform in each round of combat. Trek isn't a purely action-adventure series, so why the designers chose to saddle it with a persnickety, over-detailed system for resolving fights, I have no idea. What really set the game apart, though, were two brilliant sub-systems: character generation and starship combat. Character generation was what today would be called a "lifepath" system, focusing on the character's education and career and using them to determine what skills he picks up before the start of play. The result was much like Traveller's own brilliant character generation system but without the possibility of death and with much more specificity. A newly generated Star Trek character began with a history; you knew where he'd served and what he'd done while he was there -- and all with a few simple dice rolls. Character generation wasn't as fast as Traveller's but it was still reasonably breezy and a fun mini-game in its own right. Starship combat was equally remarkable. 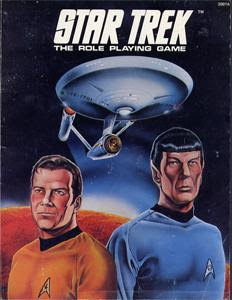 Rather than reducing space battles to a wargame-within-a-RPG, Star Trek made it an opportunity for roleplaying. Each player character assumed a role on the bridge and had responsibilities that contributed to the success or failure of their ship's battle against enemy vessels. The game included paper "display panels" that tracked things like power output (for the engineer), weapons fire (for the helmsman), sensors (for the science officer), and so on. It was great fun, if occasionally slow, and it did demand a fairly large group of players to work well, but, back in those days, having a gaming group of 6-10 people wasn't uncommon. FASA published Star Trek primarily in the years before the airing of Star Trek: The Next Generation, when Paramount didn't treat the property as the jewel in its media crown. Consequently, there was no exhaustive list of canon beyond the episodes of the Original Series and the (at the time) two movies -- the Animated Series was used only sparingly -- and even these were treated in a more fast and loose fashion than became common after the advent of TNG. This enabled FASA to expand the setting in all sorts of fascinating ways and, as the referee, I didn't feel boxed in by the weight of hundreds of hours of television and film, not to mention novels, comic books, and video games. Back then, Star Trek could still be plausibly called an "open" setting and I reveled in that. FASA eventually lost the license to Star Trek, but my enthusiasm for Trek-based RPGs never waned. I was a big fan of many of Last Unicorn's products in the late 90s, particularly the near-perfect Original Series RPG, an autographed copy of which still sits proudly on my shelf. Since then, I've often considered starting up another Trek game but, if I did, I'd probably ignore anything not directly derived from the Original Series. I simply don't have the stomach for dealing with all the minutiae the various series and movies have generated in the decades since 1969. And you can bet that, if I did so, I'd be using FASA's RPG. I was extremely glad to meet Merritt in person, for I have admired his work for 15 years. He has certain defects — caused by catering to a popular audience — but for all that he is the most poignant and distinctive fantaisiste now contributing to the pulps. As I mentioned some time ago — when you lent me the Mirage installment — he has a peculiar power of working up an atmosphere and investing a region with an aura of unholy dread. 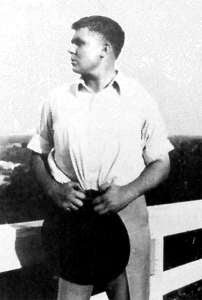 HPL would later, along with Robert E. Howard, collaborate with Merritt on a round-robin story called "The Challenge from Beyond." It's not a particularly noteworthy piece, for any of the writers involved, but it's evidence that, once upon a time, Merritt was at least as highly esteemed as Lovecraft and Howard, two writers whose literary stars have risen since their lifetimes, in contrast to their older colleague. Today, almost no one, including aficionados of fantasy and science fiction -- genres he helped to develop -- talks much about Merritt. I knew his name, of course, since Gary Gygax included him in Appendix N and often noted that he was one of his favorite fantasy authors. Despite this knowledge, I hadn't read much by Merritt until comparatively recently. Part of it is that his stories are frequently out of print. At least some of them are in the public domain, but, being a stodgy old traditionalist, I like books, meaning that, if I can't find a physical volume of an author's works, I often don't read them. Many older authors, such as H. Rider Haggard, for example, are readily available in inexpensive paperbacks, making them much easier to obtain by those uninterested in trolling used book stores for obscure novels. I saw that he was clothed in the same white robes. There was a broad belt either of black metal or ancient wood around his middle. There was a similar cincture around his breast. They were inlaid with symbolings of silver ... but who ever saw silver shift and change outline ... melt from this rune into another ... as these did? ... The servants had quenched their torches, for now the corposants had begun to glimmer over the standing stones. The witch lights, the lamps of the dead ... Glimmering, shifting orbs of gray phosphorescence of the grayness of the dead ... Now the buzzing began within the Cairn, rising higher and higher until it became a faint, sustained whispering. It's not hard to see why Lovecraft was so enamored of Merritt's prose -- or why he accused him of "catering to a popular audience." Merritt's style is neither fish nor fowl, mixing many aspects of pulp literature into a unique elixir that's remarkably intoxicating. As Lovecraft notes above and, as I stated in my review of The Ship of Ishtar, Merritt is a master of atmosphere and setting a scene. He takes the time to describe the environment in which his fantastic tales of lost races and eldritch horrors occur and it's this tendency that truly set his stories apart from those of his contemporaries and successors. Moreso than most pulp writers, Merritt truly transports his readers into another world, using his prose to act as their eyes and ears. I've still not read the entirety of Merritt's corpus and it may be some time before I do, but it's a project to which I am committed. Merritt's unusual style might not be for everyone. However, his ideas are without peer, which explains his great popularity in the years before World War II. I'm increasingly of the opinion that his stories could find an audience today if they were more readily available. I think he's no less accessible than Lovecraft and, given that his protagonists aren't bookish, mentally fragile antiquarians, they're probably more in line with popular tastes than those of the Old Gent. More than anything, what Merritt needs are some champions who'll do for him what others have done for Lovecraft and Howard: remind the current generation what past generations saw in these great artists. Here's a clip of some rare footage of Bob Clampett's never-produced War Lord of Mars animated film, which, if it had seen the light of day, would have been the first full-length cartoon ever made, beating out even 1937's Snow White. Thanks to Ryan Harvey at Black Gate Magazine for first posting this material. Will D&D dead end when its novelty dies? That is impossible to answer. It is my personal opinion that the game form is a classic which is of the same stamp as chess and MONOPOLY® ; time will be the judge. More than three decades later, I think it's pretty clear: while D&D's novelty is dead, that fact doesn't preclude its being considered a classic game. Tabletop roleplaying may not be as faddish as it once was, but it's here to stay, in one form or another. As I noted yesterday, there's a very real sense in which popular culture can be divided into "pre-Dungeons & Dragons" and "post-Dungeons & Dragons" eras. Can the same be said of Monopoly or Risk or Clue, three games most children have owned and grow up playing with their friends. Given that, isn't it about time that some early edition of D&D be re-published in a "nostalgia edition?" Goodness knows I loathe the term "vintage" or "classic" when applied to early editions of the game -- never mind "legacy" -- but these are marketing terms with wide currency. 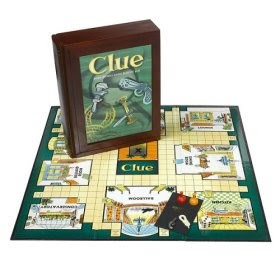 Many popular boardgames have been re-released in nostalgia editions, using graphics and components from long out-of-print versions. Such editions appeal to nostalgia, of course, but they also emphasize continuity with the past by allowing multiple generations to share their common experiences. My parents played Monopoly when they were children, for example, just as I did and my children do. And what's important here is that three generations of us played the same game and that game is still available today in an unaltered form. Why doesn't D&D deserve the same treatment? While my dream would be to see a re-released version of the LBBs, that's likely not practical for many reasons. But what about Moldvay/Cook? My issues with it aside, it's the first truly mass market version of the game, one that's well written and clear and yet not so far removed from the early culture of the hobby as to be alien to it. Plus, its "look" is unlike anything we've seen in many moons, making it an ideal candidate for being deemed "vintage" by the marketers who love such terminology. Wouldn't it be great to be able to buy this version of the game forever? A game I could not only buy for my children but that they could buy for theirs in the future? Is there any good reason why this hasn't already happened? After reading this, I can't decide: do I want to watch Escape from New York or Big Trouble in Little China? Robertson Games is hosting a Design a Dungeon Room Contest. One dungeon room entry per participant. Each dungeon room submitted must include at minimum: a name and a description of the room. Dungeon rooms may optionally be submitted with a small map showing the room’s layout and contents. Your room can be any size and shape up to a maximum of 60′ x 60′. The room must have at least one doorway leading out of the room along one of the exterior walls. Your dungeon room should be compatible with one of the following games: Original Dungeons & Dragons, Basic Dungeons & Dragons, Advanced Dungeons & Dragons, Labyrinth Lord, OSRIC, or Swords & Wizardry. A room can contain new creatures, items, or NPCs with special spells, skills or abilities, but all material supporting your entry must fit on a single letter sized sheet of paper at no less than 10pt size. All entries are due by Midnight EST on January 31st, 2010. All entries to the Design A Dungeon Room Contest are submitted under a Creative Commons Attribution-Share Alike 2.5 Canada License. Details on the contest's judges and prizes is available here. Joseph Bloch, the Greyhawk Grognard, has at least revealed the true nature of his previously announced "Project Shibboleth:" the creation of a "retro-recon" of a Gygaxian 2e, based on what we know of Gary's stated plans for such an endeavor. As someone who remembers well those articles Gygax penned in Dragon in which he laid out his plans for a new edition of AD&D, I won't deny that I'm more than a little intrigued by Joe's project. 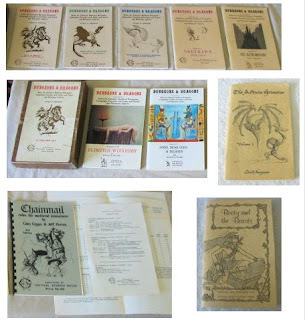 As he's proven again and again on his blog, he's a keen reader of AD&D and has probably thought more about Gygaxian 2e than anybody in our little circle of old schoolers. So, if there's any chance at all of something like this seeing the light of day, Joseph is the man to do it. My only advice to him is this: don't take any advice from anyone in the peanut gallery, including me. Forge ahead according to your own lights; you know what you're doing far better than any of us do. The end result, even if it's not something I or anyone else will universally acclaim as a "true" successor to Gary's magnum opus, will be far, far better if you follow your muse rather than anyone else's. Good luck! This past weekend marked my daughter's tenth birthday. One of the gifts she received was a video game she'd wanted, a -- if you can believe it -- cheerleading simulation. Anyway, as I watched her play this game, I noticed that, to play, she first had to create a character and that, through play, her character acquired experience points to represent her virtual cheerleader's increase in skill. At certain XP thresholds, her character acquired new moves and access to other goodies unavailable to less experienced characters. Now, none of this is exactly clever or innovative. Literally thousands of video games over the last quarter century or more have included such game mechanical architecture. But I think, given how far removed conceptually my daughter's game was from Dungeons & Dungeons, that this was the first time I well and truly understood the extent to which those three little brown books forever changed the world. The basic gameplay template Gary and Dave laid down in 1974 not only set the course for the vast majority of what followed in its wake but created the concepts and vocabulary that ordinary people, with no connection to D&D or the hobby understand intuitively. Levels, hit points, character classes, XP: these and many more all achieved their vast currency through their use in D&D -- not a bad legacy for men who loved games as much as Gary Gygax and Dave Arneson did. Nearly all of the authors whose works I highlight in this space each week are those whose fame was once greater than it is today. There are exceptions, of course -- Robert E. Howard and H.P. Lovecraft being two good examples -- but contemporary fame often brings with it misunderstanding, with the author's stories and ideas reduced to mere caricatures. For good or for ill, Abraham Merritt has avoided that fate, his works largely unknown today, despite the fact that he was arguably the most popular fantasy and science fiction writer before World War II. I enjoyed the rare and original fantasy of this tale, and have kept it longer than I should otherwise, for the sake of re-reading certain passages that were highly poetic and imaginative. Merritt has an authentic magic, as well as an inexhaustible imagination. 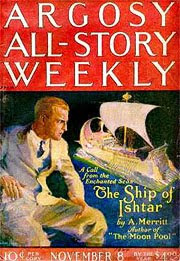 The Ship of Ishtar was originally released as a six-part serial novel over the course of November and December 1924 in Argosy All-Story Weekly. These parts were then collected into a hardcover in 1926, but in abridged form, excising some chapters and rearranging the text. It's this incomplete version of the story that's been reprinted again and again over the decades, with only (I believe) a single 1949 edition including the full text of the novel. The recent Paizo edition follows that 1949 edition, making it the first edition in 60 years to give readers the book as Merritt intended it. The Ship of Ishtar is the tale of Jack Kenton, a modern man who receives a package from an old archeologist friend. The package contains an ancient stone, inside of which Kenton finds a remarkable model of a ship. The ship is a magical creation and draws Kenton into it, pulling him backward in time to Babylonian times and into the midst of a struggle between the followers of goddess Ishtar and followers of the god Nergal -- the cursed inflicted because a priestess of Ishtar and a priest of Nergal dared fall in love with one another against the wishes of their respective deities. Now, the lieutenants of the priestess and priest, both of whom, for their own reasons, aided their superiors, is trapped on a ship divided between light and darkness and from which there can be no escape. Kenton, not being a man of this time and not laboring under the curse of the gods, can move freely back and forth between the two sides of the ship. Having fallen in love with the beautiful Sharane, priestess of Ishtar, he offers to go to Klaneth, priest of Nergal, and attempt to find a means by which to end the conflict on the ship. In this respect, The Ship of Ishtar resembles many pulp fantasies of its time and after: a modern man, thrown into an unusual locale/time, finds himself able to go places and do things that those native to it cannot. What differentiates Merritt's novel, though, is its gorgeous prose and deep characterizations. Merritt is an author who takes his time in telling a story, presenting little details and nuances that other authors would rush past in an effort to get to the action. This may be why Merritt fell out of favor in the years after the Second World War: he's not a "breezy" author. That's not to say his prose is slow going, because it's not. Indeed, I find Merritt much easier to read than, say, Lovecraft or even Smith, both of whose prose is every bit as adjective-laden and evocative. Yet, Merritt dwells on details, particularly the beauty or ugliness of characters, and it's possible that, for some, these details get in the way of their enjoyment. I think that's a pity, because, as I said, Merritt's text is not plodding and his descriptions and dialog are every bit as appealing as his action, but perhaps he is an acquired taste. Regardless, Abraham Merritt is an important early fantasy author, one mentioned by Gygax in Appendix N, and The Ship of Ishtar may well be his masterpiece. Many thanks to Paizo for again making it available and for preserving the entirety of its text. With luck, Merritt may soon gain the wider admiration he so richly deserves. "Thayt Chevski, hye is ane rottah. I liketh him notte ande blayme hyme gretely. Lette hym bee beyten withe stikkes." If you enjoy this blog, please consider a small donation to show your appreciation.